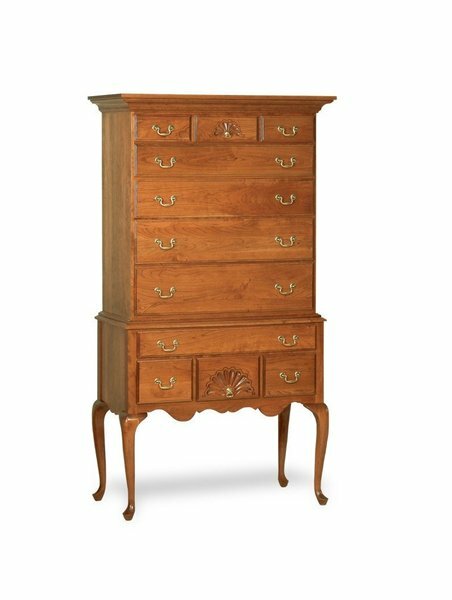 This Flat Top High Boy Dresser is elegantly designed to create a tie with the past as well as a promise of an heirloom in the future. This Amish made dresser is available in oak, cherry or maple solid wood - handcrafted by expert Amish craftsman. The Amish Flat Top High Boy is handmade in two piece for ease of moving! Dovetailed drawers and a finished back is standard for construction of this dresser. Bench made in the heart of Amish country, this high boy dresser has dust covers between all drawers, three different drawer slide options, and is finished off with a multi-step conversion varnish finish. If you have any questions on customizing this unique bedroom furniture case piece, please call in at 866-272-6773. Our Amish Furniture Specialists will be happy to help you out.